12″What do you think? If any man has a hundred sheep, and one of them has gone astray, does he not leave the ninety-nine on the mountains and go and search for the one that is straying? 13″If it turns out that he finds it, truly I say to you, he rejoices over it more than over the ninety-nine which have not gone astray. 14″So it is not the will of your Father who is in heaven that one of these little ones perish. My wife and I have been members of at least one church at all times for the past 17 years. Our attendance and our involvement has varied some, but I don’t think we ever missed long enough to earn the term “unchurched.” I’m glad for that, but I know that a major reason for our regular attendance is that we’ve always lived in a town where someone knows us. The first place we lived was near her parents, and my wife Amy was a member at the Catholic church where we were married. Now we live in the same town where I graduated from high school, and I have become thoroughly obligated to attend the church where I was confirmed. We had a brief window of opportunity when we first moved back to skip out on church, but it was closed pretty quickly by friends and family who simply insisted. Before too long, I found myself teaching an adult Sunday school class (can we come up with a better name than Sunday school, it sounds so felt-panel and koolaid?) and then a pastor informed me that I may well be teaching this class forever, so now I’m pretty much locked in. The fact that I am connected to this area is a big part of why I’m expected to attend. But that’s rare in this area. We have lots of transplants — people who come from all over, who find it easy to attend occasionally, or not at all. We have had people who have joined our church one Sunday, and a year later qualify as unchurched. A year after that and we remove them from the membership roll. We know what we should do about this, and we try. Small groups, phone calls, not overwhelming new members, but making sure they know what’s expected. Sometimes it works, sometimes it doesn’t. I think we do have to be more intentional, and I think a good portion of that responsibility lies on the pastor’s shoulders, because that is who people go to when they are thinking of joining the church, even if the reasons for joining have more to do with the congregation. One of our pastors mentioned one time that he occasionally lost sleep over members who quit. We should all be more concerned about the missing members. My mother is one of the ones who no longer attends. I remember her making me go when I was under 18. She quit coming when our previous pastor offended some friends of hers. Her friends have been back for over three years. Now she’s waiting on a new pastor. I don’t expect to see her in July. Even though she has friends and family at the church, it’s not enough to combat the things she’d rather do on Sunday morning. And I suppose that’s what I have to remember the most. Despite all our planning, our intentional work, members still have a choice. We can’t make them come, and once they come, we can’t make them be disciples (though my tendency towards legalism says we should try a little harder). When all else fails, we have to turn to God and ask that His will be done. Help us find the missing sheep, Lord, and help them to rejoin the flock. I own part of a farm. I don’t really, but I do share parts of two farms. I actually participate in community supported agriculture, on two different fronts. One area is in my local church. For three years now, I get a whole lot of beef in my freezer in January or February, from cows that I pass just about every day. I go to church with the people who raise these cows. I helped organize the wedding of their daughter, who has watched my kids on several occasions. When someone stole money from me, they helped me cover the costs of what was taken. I’ve even had occasion to be angry at them. The other part is with an “official” CSA, and I’m not nearly as tied to the community that it comes from. The farm is over an hour away and if I ever happened to be just driving by, I would be seriously lost. But I’m still glad for it, and have seen the farm, and met some of the ones that have done the work. This farm has the Avalon Acres name. As the result of work from a local reading group, several families have been participating in this through the winter, taking turns going to pick up the food and bringing it back to distribute. It’s been great. It’s not organic, but it’s raised by people who care about what they’re doing and want us to share the harvest with them. If you’re in most of Middle Tennessee, or the Jackson area of West Tennessee, you can participate too. I haven’t balanced out the cost vs. the grocery store, but the difference in other areas is phenomenal. The quality of the meat (we’ll soon find out about the vegetables)is great. Yes, there are downsides (I have no idea what to do with hog jowl) but I am glad that about 80% of the meat I eat comes from within 100 miles of my house. There are many reasons for the resurgence of interest in small farms. Books like Fast Food Nation and movies like Supersize Me have reminded us of our separation from the origins of our food. Opportunities like CSAs and fair trade purchases shouldn’t just be about assuaging our guilt, but about being closer to one another. When I was in my college days, I had issues with organized religion. Then I got over it. Now I’m in yet another phase, that may pass, which is primarily against organized church. Maybe reading Leithart had something to do with that, but I think it had more to do with acquaintances I’ve made through the Ekklesia Project. People who are members of cell churches, house churches, new monastic groups all make me wonder how things might be different. And then I read Wendell Berry, and he gives the passage below which sums up a lot of things I have been thinking for a while. The organized church comes immediately under a compulsion to think of itself, and identify itself to the world, not as an institution synonymous with its truth and its membership, but as a hodgepodge of funds, properties, projects, and offices, all urgently requiring economic support. 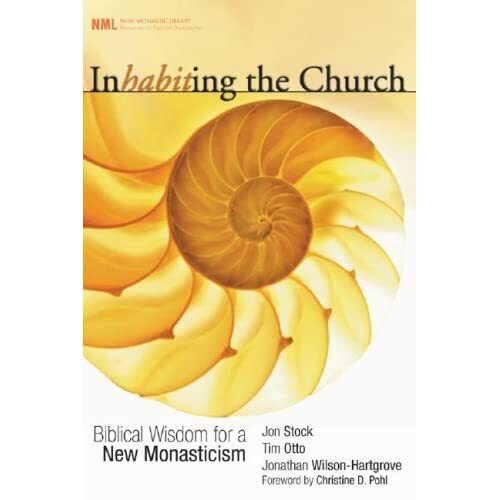 The organized church makes peace with a destructive economy and divorces itself from economic issues because it is economically compelled to do so. like any other public institution so organized, the organized church is dependent on “the economy”; it cannot survive apart from those economic practices that its truth forbids and that its vocation is to correct. If it comes to a choice between the extermination of the fowls of the air and the lilies of the field and the extermination of a building fund, the organized church will elect — indeed, has already elected — to save the building fund. “If I were slightly younger and not employed here, I think it would be a fantastic experience to be on the front lines of helping this young democracy succeed. I am somewhat drawn to monasticism. Even in high school, when I knew very little of what it might mean to take such vows, a friend and I discussed it as a possibility. He was hard-pressed to find a good Baptist monastery though. I guess there really aren’t many Methodist monasteries either. Friends of mine are “new monastics” though they’re part of a group that’s been around longer than that term. They have my attention. I wonder what it would be like. They’re not just men, they are families, and they work together and live together, not sequestered, in the world, but not of the world. One of them, will hopefully be visiting us next month. I look forward to seeing him. One of the things which I think draws me to this sort of living is the necessity of not having too much stuff. I don’t know how it happens that I have 6 stainless steel travel mugs when 2 years ago, I just wanted one. Why it’s possible for 3 of our family members to be on a computer at once (and if I really wanted to, it wouldn’t be difficult for all four of us to do so) is explainable, but it’s probably not good. Enough about me. Here’s an old article about new monasticism. Jon Stock, mentioned in the article, has also worked with others on a book about it. It’s the pic above. I haven’t read it yet, but I’ll discuss it when I do.